Our lovely guests, husband and wife team from Taipei, Taiwan enjoying a great time with their host, Victor Khoo. They started their day with Victor picking them up at 8:45 am from their hotel – Muntri Mew – in George Town. From there, they made their way to his local wet market in Tanjung Bungah, which took 25 minutes to drive. Along the way, Victor explained his plan for the day and discussed the differences between each dishes to cook. At the market, both Arwen and Gilbert, had a great time buying the ingredients together with Victor, choosing and picking some of the vegetables themselves. After buying all the ingredients, we stopped at the market’s foodcourt to experience Penang local breakfast. Arwen and Gilbert got to taste wantan mee soup version, roti canai, roti telur with home brewed barley drinks. Back at Victor’s kitchen an hour later, Arwen and Gilbert shared the tasks preparing and cooking the dishes. During the class, we had a great time knowing each other, shared some laughters and ate together. Food brings people together even for the first time they meet. 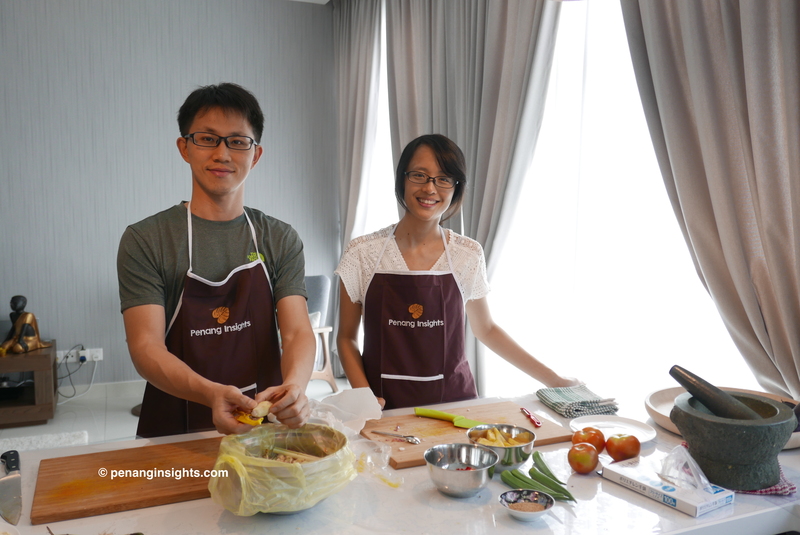 Thanks Arwen and Gilbert for making Penang Insights your preferred choice destination in Penang for your own private cooking class.